I have spent the last 5 months designing, buying parts, redesigning, and buying more parts. I am finally at the point of cutting metal and bolting stuff together (the fun part). I have to say, it feels pretty good. 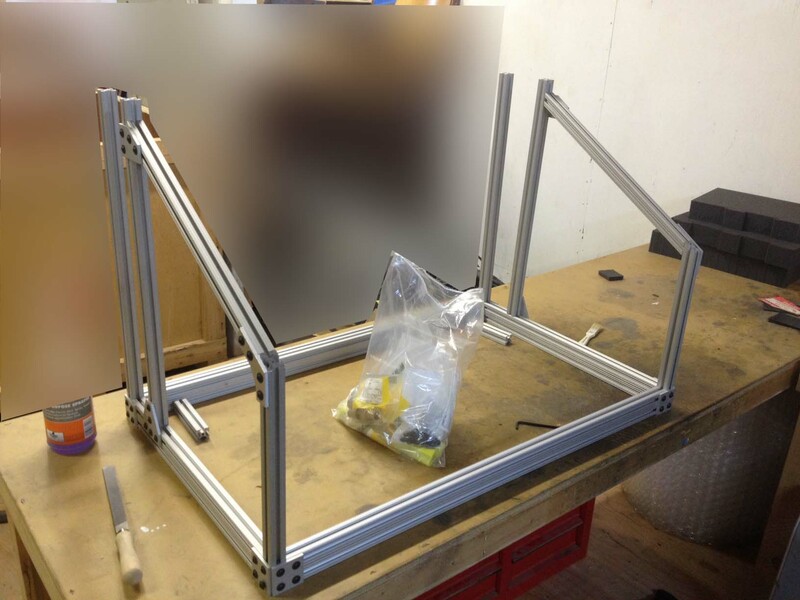 Below you can see the 80/20 frame (mostly 1010 series with a lower frame made from 1020 series extrusion) , it is still missing a few crossbars near the top, as I hadn’t yet tapped the ends of the extrusion to accept a corner fitting. I was initially concerned about how rigid the 1010 uprights would be given that the they are only attached to the bottom 1020 frame with two plates each. I found that it holds up surprisingly well to small amounts of force (hand applied), and this is even without the aluminum weldment that fills the space between the two angled bars. You can also just barely make out the waterjet cut 120 degree brackets on the front angle. No longer just shapes on a computer screen. I’m also very close to some initial tests with the pneumatics. I have new sensors for air cylinders that interface better with a micro controller, and have started breadboarding the transistors to drive the solenoids valves.